Some interesting Drive Band bullets were on display at IWA Show. As we publish this in the USA, the IWA Outdoor Classics trade show is drawing to a close. Today marked the last day of the 4-Day exhibition in Nuremberg, Germany. IWA is a big event, drawing over 1600 exhibitors, as well as nearly 50,000 show visitors from around the world. Here is our IWA Day 4 report, with more images from the show. Photo Credit for IWA images: NuernbergMesse / Frank Boxler and Thomas Geiger, All Rights Reserved. Yes they like big boomers in Europe too. Here is an Austrian Steyr-Mannlicher HS .50-M1 in .50 BMG. The sound of silence. The new German-engineered Blaser R8 Ultimate Silence features an integral silencer. The over-sized barrel functions as the silencer. Some of the best specialized competition shooting coats and pants are crafted in Europe. Here’s just what you need to open a bottle of good German lager — a stag-horn bottle opener. Prost! Share the post "IWA Outdoor Classics 2019 Concludes Today"
We’ve found a great choice for a young man’s first centerfire rifle. The Howa Mini Action Youth Model in 6.5 Grendel, is a compact package with an accurate, moderate-recoil chambering. This special Youth Model has a shorter stock with 12.5″ length of pull (LOP). Weighing under 5.7 pounds with a light-contour 20″ barrel, this rifle is light enough for a young man to carry easily. The Howa 6.5 Grendel Youth Model may be hard to find at retailers, but if you shop around you can find examples on Gunbroker.com at attractive prices. If you can’t find the Youth Model, you can get a standard Howa Mini and cut the stock to shorten the LOP. Yes a young man could start off with a big .30-06 shooting 200-grain bullets. But we think it’s wise to begin with a smaller, lighter-recoiling caliber. There are countless cartridge choices, but the compact 6.5 Grendel offers a good balance of power and accuracy with moderate recoil. The 6.5 Grendel boasts ballistics superior to the venerable 30/30, so it is capable of taking whitetail deer and other medium-sized game. Recoil is milder than a 30-caliber. This cartridge also works great for target work. Factory hunting ammo is available from Federal, Hornady, and Alexander Arms. Hunters need to know distance with precision. A compact Laser Rangefinder (LRF) will help you spot and range your prey. The Leica CRF 2000-B, one of the best hand-held LRFs on the market, is on sale now for just $399.00 — a great bargain! Walkie-Talkies are “must-have” items for long-range shooting. The 22-CH Motorola T100 Two-Way Radio is an Amazon Favorite in FRS/GMRS Handheld Radios. Share the post "Hunting Options for Fathers and Sons — Great Gear Choices"
It’s hunting season, and we know many readers will be pursuing a prize buck this fall. 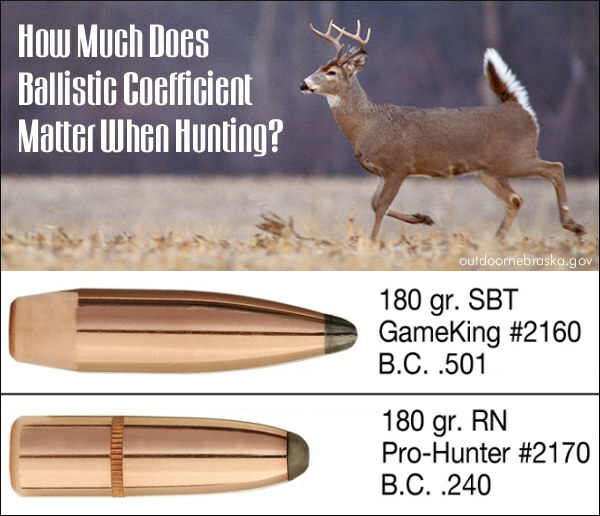 But how will your hunting load perform? That depends on shot placement, energy, and terminal ballistics. Share the post "Help for Hunters — Video Explains Terminal Ballistics"
Judging by the calls I’ve had through the years, I think some shooters might be placing too much importance on Ballistic Coefficient (B.C.). The best example of this comes from a call I had one day. This shooter called wanting the ballistic coefficient of one of our Sierra bullets. After I told him he seemed a little disappointed, so I ask him what his application was. Long range target, deer hunting in the woods? Talk to me. As it turned out, he hunted deer in open timber. He very rarely shot beyond 100 yards. I pointed out to him that, under 200 yards, B.C. has little impact. Let’s compare a couple of bullets. In a hunting situation, under 200 yards, having a difference of only .58” isn’t going to make or break us. But when elk hunting in wide open spaces it could mean everything. The next time you’re choosing a bullet, give some thought about the distances you will be shooting. Sometimes B.C. isn’t everything. If you have any questions, please give the Sierra Bullets technicians a call at 800-233-8799. Share the post "Is Bullet B.C. Important When Hunting? (Answer: It Depends)"
Team USA Olympian and ISSF World Cup Winner SFC Michael McPhail is one of the world’s best smallbore rifle shooters. He is also an avid hunter, who enjoys harvesting game with centerfire rifles. In this excellent short video from the USAMU, McPhail shows how competition shooting positions can be adapted for hunters. McPhail shows how well-established positions can provide a more stable platform for hunters in the field. That can help ensure a successful hunt. McPhail demonstrates three positions: kneeling, supported prone, and sitting in a tree-stand. Last but not least, McPhail shows some clever treestand tricks. McPhail recommends a position with your weakside leg pulled up and firmly braced on the front rail of the treestand. You can then rest your support arm on your leg. (That would be the left arm for a right-handed shooter). This provides a rock-solid position when shooting from a stand. The second half of the video shows how this works. Share the post "Position Shooting Tips for Hunters — How to Stabilize Your Shot"
Forum member Jerry S. posted this story yesterday in our Shooters’ Forum. It shows that, with the right bullet and good shot placement, the diminutive 6BR is more than enough cartridge for deer. I decided to try something different this year. Instead of dragging out my trusty .44 Smith or the 6.5×55 Remington 700, I took my 6mmBR Norma Prairie Dog rifle deer hunting. We got a lot of wet sloppy snow the week before the opener and had a freezing drizzle on the first morning. I decided to hunt close to the house since my old bones couldn’t handle the trip to my normal hunting stand. I set the 6mmBR P-dog rifle up on my shooting bench and began the long, cold wait. The deer trail I was watching is about 180 – 230 yards from where I was sitting. At about 2:30 this afternoon, I was watching some does feeding along the trail and looked away for a minute then looked back and saw a third deer moving up behind them. A quick check in the spotting scope showed horns and I got behind the rifle. There is no safety on my P-dog gun so it wasn’t loaded and I quickly chambered a round. The does stepped into the woods and the buck stopped for a minute and looked right at me. I centered the cross hairs on his chest and touched the trigger. I could hear the impact as he leaped straight in the air and hit the ground running into the woods. I figured it was a good hit, so I poured a cup of coffee and relaxed for a bit to let him tire out and drop. After my coffee, I picked up my 6.5×55 and went out to where he was shot. I was 190 yards from my bench and there was no blood. He was headed toward a swamp south of me so I figured I’d cut him off and see if I could cut his trail farther into the bush. I hadn’t gone ten yards when I came across a good blood trail. I followed it for a few more yards and found him crumpled up. He had only gone 25 yards from where he was shot. While I was looking at him and taking photos, two more deer showed up. You can see one standing on the other side of my rifle. My buddy brought his 4-wheeler over and helped me drag it to the house where we skinned it out. The bullet had taken the top off the heart and he was totally bled out. All in all, it was a successful hunt, and the 6mmBR did its job. Share the post "Holiday Hunt — 6mmBR for Deer"
Redding Reloading Equipment has responded to the requirements of Indiana Deer Hunters with the addition of the 358/25 WSSM to their line of regular production “Custom Series” reloading dies. The following 358/25 WSSM dies are available: full-length sizing die, neck-sizing die, and a 3-die deluxe set including both full-length and neck-sizing dies plus a seating die with crimp. This 358/25 WSSM wildcat cartridge has gained favor as an alternative to standard handgun calibers under Indiana’s hunting regulations, which allow the use of cartridges with a bullet diameter of .357″ or larger and a maximum case length of 1.625” during Indiana’s firearms deer season. The 358/25 WSSM can be used in both bolt action and modern sporting rifle styles. The round produces effective terminal ballistics on whitetail deer. For more info or to order a current Redding catalog contact: Redding Reloading Equipment, 1089 Starr Road Cortland, NY 13045, or visit Redding-Reloading.com. Share the post "Redding Adds 358/25 WSSM Dies for Indiana Hunters"
Deer 1, Hunter 0 — Or Why You Should Practice Before the Hunt. Should you sight-in your rifle and practice shooting before you head off into the woods on your deer-hunting trip? Yes, indeed. In the video below we don’t know whether the unlucky hunter’s scope wasn’t adjusted correctly, or maybe he was just a miserable marksman. Many of you may have seen this video before, but it’s still pretty amazing. NOTE: If you are at work, you may want to turn down your volume before launching the video. 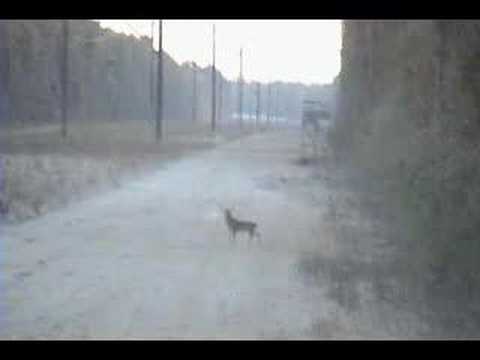 Share the post "Deer 1, Hunter 0 — Or Why You Should Practice Before the Hunt."